Fantastic Assembly & Song Resources for Science Week! British Science Week starts this Friday 11th March and we have some excellent assembly & song resources to share with you. Our Whole Class Assemblies for KS2 and songbook ‘Let’s Sing About…Science!’ are the perfect combo for all your KS2 Science Curriculum needs. Science themes incorporating simple practical demonstrations, narrative and short dramatic/comedy presentations. Detailed scripts, stage directions, and props/costume lists. Songs include: ‘Sound Is All Around’, ‘Push & Pull’, ‘Go With The Flow’, ‘Count The Planets’, ‘What Makes A Living Thing’ and many more. 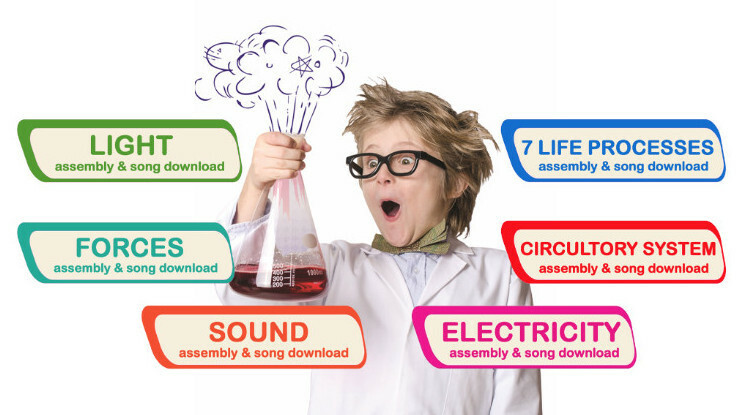 We have now have individual assemblies and songs to download for lots of Science-themed subjects! Each assembly is about 20 minutes long for between 20-40 children to take part in. The perfect way to reinforce subject knowledge whilst also informing and entertaining the rest of the school!